Tuck into a tasty Thai buffet for just £13.95! Available every Sunday, 12 - 3pm. Book online for free text confirmation or call 01423 606 869. Set Dinner Menus from £25 per person! Book one of Sukhothai's delicious set menus starting from £25 per person. A vegetarian menu is available. Book online for free text confirmation or call 01423 606 869. 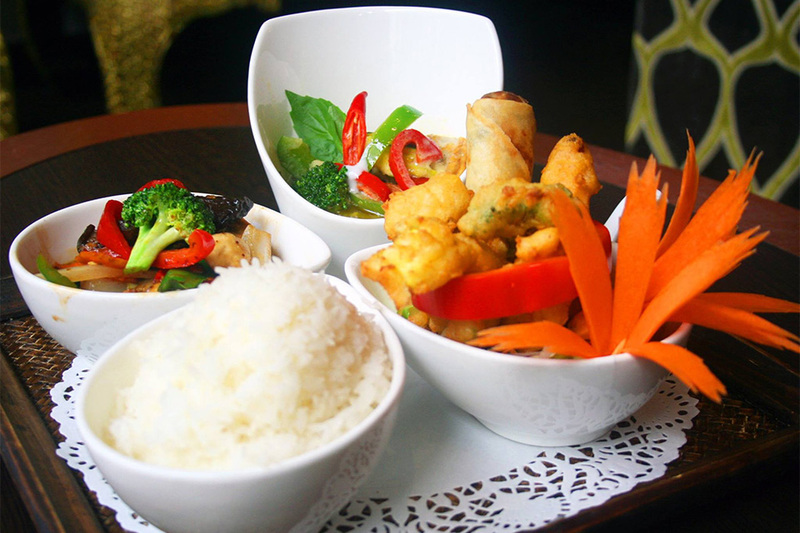 For just £14.95 treat yourself to this amazing new express lunch offer at the Sukhothai! Please note: Express Menu only available Sunday to Thursday 12pm - 6:30pm. Book online for free text confirmation or call 01423 606 869. Lovely place and staff very polite, helpful and attentive. Same quality each time we visit. Top restaurant with lovely atmosphere. Food good but a little expensive for portion size. As always the meal was amazing Sukathai. We will come and visit again next time we are in Harrogate. Beautiful food and great atmosphere. Sunday night. unable to book at preferred time of 7.00pm as restaurant described as full. when we walked past it was empty. starters were good but mains disappointing especially seafood. Usually love sukothai but overall experience fell short this time. Been before and the staff always make you feel special and comfortable. The food is excellent. We wanted a certain dish which had 3 chilli signs and asked for it to come very mild and it did was so tasty without being hot hot hot. Good work Mel, she was so polite. The serviced and attention to detail was amazing. This is a very special place. The food is prepared and presented beautifully. The delicate textures and flavours matched with fair priced wines were a delight. Delicious meal. A small complaint about the deep fried vegetables being served under the salad an soggy by the time it reached me. Delicious meal with great service! Consistently great place to go out to eat! Went here on new years eve the place was beautiful the service was fantastic and the food didn't take long to arrive was hot fresh and delicious. We enjoyed the meal at Sukhothai, it was very tasty! The meal was excellent. Service was prompt and the staff were polite and attentive. We will definitely be going again and again and will spread the word. Thanks for serving quality, tasty foods. Our food was an absolute delight but the service let the restaurant down. We had to wait too long for someone to take our order, too long for food to be served and too long for the bill to be produced. Food was fantastic, great atmosphere, prompt with food. Enjoyable evening as always. My favourite restaurant in Harrogate. Quiet time, 6pm, good service. Had meal deal of 2 courses plus drinks and tea, reasonable prices. Smallish portions but quite adequate and well cooked and presented. Good value set meal, nearly too much to eat. I thought that the sauce in our stir fried prawns was too sweet. The atmosphere was great.Staff is very friendly.The meal was great.Very tasty and big portions.There was a mistake with one of our main course but they they've corrected it fairly quick. I would definitely recommend the place for my friends. Meal and service was excellent! The buffet table was well stocked to begin with but was poorly maintained with dishes remaining empty. Plates needed replenishing more frequently. There was a good choice of food and it was tasty. However, I prefer Sukhothai in Chapel Allerton. Great evening, shout out to Arjay! As usual we all loved our meal. Cant fault service. Food and ambiance were great at Sukhothai. Service was a bit slow on providing the drinks. However, we were not put under any pressure to leave and the staff were very friendly. Good food and service. Seating good. Prices not too expensive. Very enjoyable experience, fantastic service. Would definitely recommend Sukhothai. Wonderful pre-theatre experience at Sukhothai in Harrogate. The food was delicious, just like at Sukhothai in Chapel Allerton which is our comparison. Great food and ambiance at Sukhothai (Harrogate) although a bit noisy with all the birthday celebrations!! Amusing though. Really enjoyed the food and would definitely go back! Sukhothai in Harrogate is a beautiful restaurant, the meal was lovely and staff very friendly, ideally located near to the centre with multi story parking nearby. Excellent meal at Sukhothai. The starter was almost a main meal in itself! Good value. Pleased that we booked an early table as the restaurant was very busy later. Excellent service and food at Sukhothai. We tried the buffet and it was all fresh and hot! Situated in the historic town of Harrogate, Sukhothai lies among bustling restaurants and bars and sits just a few streets away from Harrogate’s busy shopping area. The stylish surroundings make this Thai restaurant a fantastic place to start an evening out with friends, whilst the convenient location also make it a great pit-stop during a day of shopping. 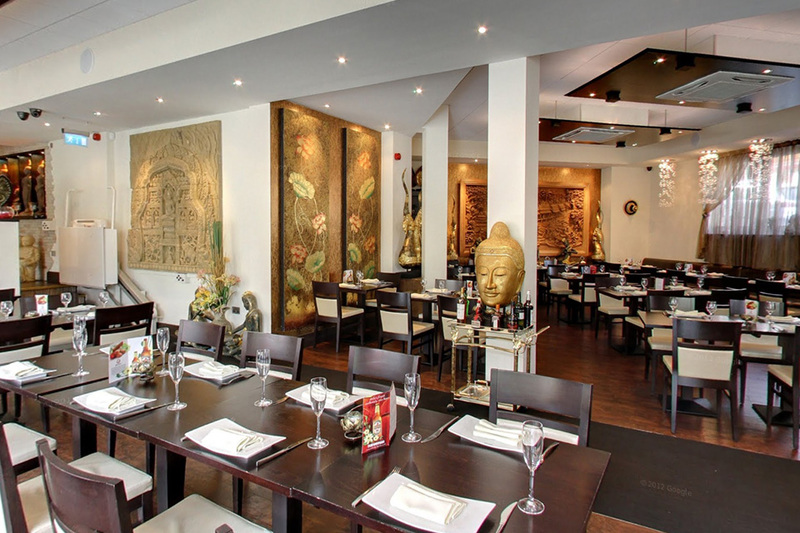 Whatever brings you to Harrogate town centre, a trip to Sukhothai is certainly one of our top choices when dining out. 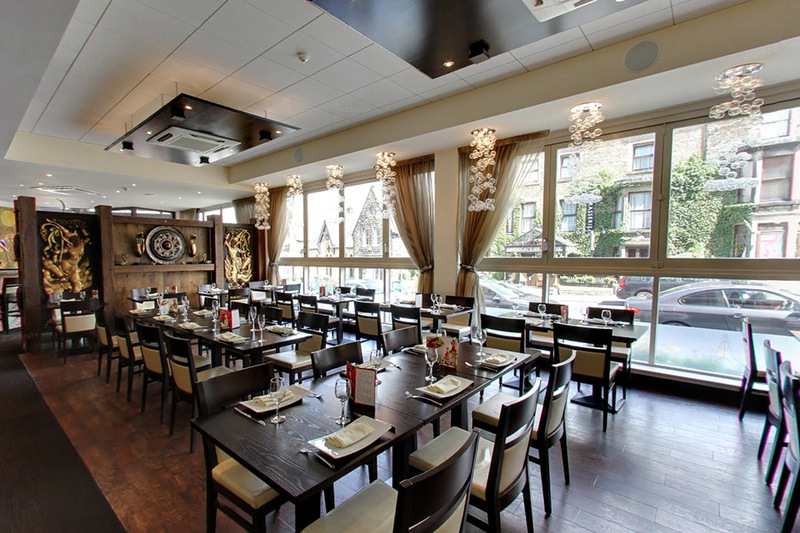 Sukhothai is part of a family of restaurants, with sister branches located in Leeds City Centre, Chapel Allerton and Headingly. Head chef and owner Ban Kaewkraikhot introduced the chain, hoping to bring a true taste of Thailand to Yorkshire. Operating since 2002, Sukhothai has a reputation for its delicious dishes and friendly service. The staff are attentive and the restaurant itself is the perfect location for a relaxed, stylish dining experience: a cream-toned palette adds a contemporary twist to the venue, with charming artwork along the walls and an extensive bar well-stocked with favourites. You’ll find yourself spoilt for choice by the menu at Sukhothai, with a wide range of starters including fish, chicken and plenty of vegetarian options. Begin your meal by sharing a mixed satay platter and enjoy a taste of more than one dish on the menu. If you’re after something light, Sukhothai’s salads are sure to catch your eye. Main courses are equally as extensive, with delicious curries, duck, fish and meat dishes alongside a section specifically dedicated to vegetarian options: each and every dish is bursting with flavour, with sweet chilli, citrus freshness and creamy coconut milk featured heavily throughout. With the addition of a children’s menu and cocktail menu, Sukhothai is the perfect setting for a wide range of diners. 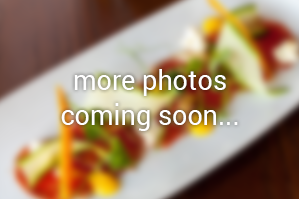 If you’re searching for somewhere exciting to dine in Harrogate, look no further than Sukhothai. 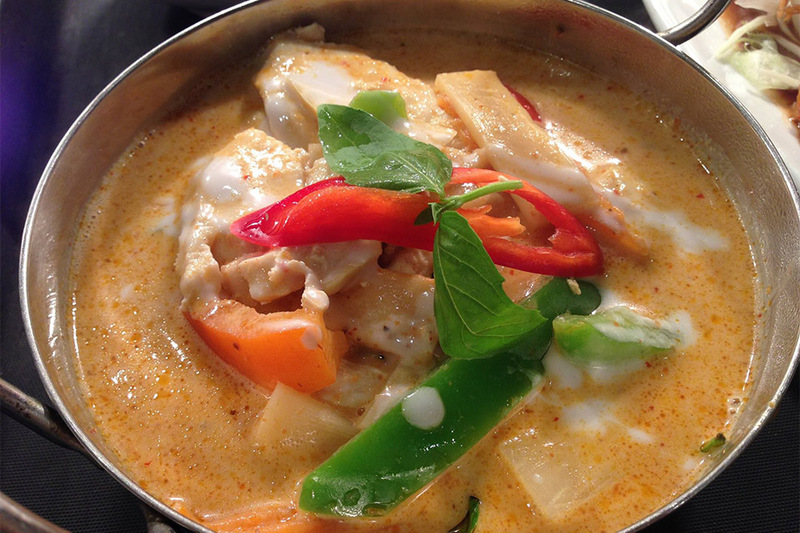 Offering an eclectic range of exciting Thai dishes, this authentic venue is sure to impress. Thai red curry, a spicier alternative to the traditional green curry, made from coconut milk, red and green pepper, sweet basil and bamboo shoots. Our take on the famous Pad Thai, stir-fried rice noodles with butterflied jumbo king prawns, bean sprouts, carrot, spring onion, ground peanuts and tofu, served in an egg nest. Choice of Chicken, Pork, Beef or a vegetarian option with Tofu. Thailand's national dessert - fresh ripe mango serve with sweet, sticky rice. delicious! Tuck into a tasty Thai buffet for just £13.95! Available every Sunday, 12 - 3pm. Book one of Sukhothai's delicious set menus starting from £25 per person. A vegetarian menu is available. 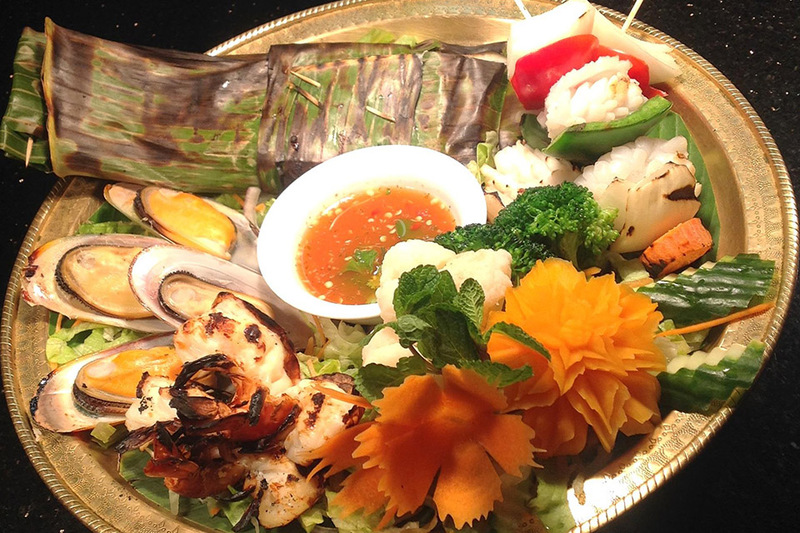 For just £14.95 treat yourself to this amazing new express lunch offer at the Sukhothai! Please note: Express Menu only available Sunday to Thursday 12pm - 6:30pm.